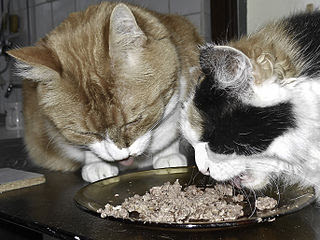 When we read about recent cases of thiamine deficiency in cats fed preserved pet meats in Sydney we also found this American report about thiamine deficiency in cats fed uncooked fish and some pate type can foods. Thiamine is essential for carbohydrate metabolism, muscle contraction, and nerve conduction. Very little thiamine is stored in the body and cats depend on a steady dietary source of the vitamin. Thiamine is naturally found in many food sources such as whole grain cereals, nuts, legumes, brewer’s yeast, but cats derive thiamine mainly from meat products, in particular skeletal muscle, liver, heart, and kidneys. Improper food storage and processing, consumption of uncooked fish that contain the enzyme thiaminase, and consumption of diets with sulfur dioxide or sulfite meat preservatives can lead to insufficient dietary thiamine. After two to four weeks of a thiamine deficient diet, cats exhibit salivation, anorexia (loss of appetite), and sometimes vomiting. If the deficiency is not corrected, then dilated pupils, bradycardia (slow heart rate), aggression, and progressive neurological symptoms such as ataxia (loss of coordination), rigid head and neck ventroflexion, twitching, loss of righting reflexes, seizures, coma, and death will ensue. Rigid head and neck ventroflexion is the most common clinical sign in cats presented to veterinarians.